Chinese Chili Chicken recipe by Dr.Chikna at DesiRecipes.com. Cut the boneless chicken pieces into 1 inch cubes. Take 1 tbsp Soya sauce, 1 tbsp corn flour, salt , egg in a bowl and marinate chicken pieces in the the mixture for about 10-15 minutes. Now in a separate wok / kadhai heat 1 tbsp. oil and add garlic paste and green chilies and saute for few seconds. Dissolve the remaining corn flour in 1/2 cup water and add to the curry stirring constantly to avoid lumps. 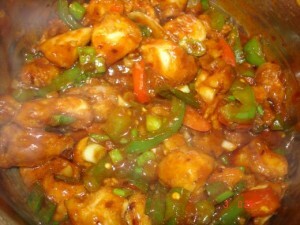 Serve chinese chili chicken hot garnished with chopped onion tops. Chinese chili chicken goes well with steamed / boiled rice. its so yummy and tasty i love this recipe wit boil rice.